Recently, Steve and I were on a ship in the Atlantic Ocean participating in a radio summit cruise. When the ship first began to move out into the ocean, I began to feel a bit light headed and dizzy. But I figured if I ignored the dizziness, surely it would go away! The only problem was that with each passing hour, my dizziness got worse and my stomach grew more nauseous. Later that night, after we got back to our cabin room and I was safely tucked in bed, the waves kicked up even higher; visions of the movie Titanic began to swirl through my head. Then I began giggling, realizing how dramatic I was being. As I lay there hanging onto the bed, my mind drifted to the story of Jesus in the boat with His disciples, and I felt deep empathy for them. Remember? The story is tucked away in the gospel of Mark and probably familiar to every child who has ever attended Sunday school (Mark 4:35-41). After a long day of teaching, Jesus and His disciples climbed into a boat. Leaving the crowd on the shore, they headed across the Sea of Galilee (probably to get some rest). Jesus fell fast asleep almost immediately with His head resting on a cushion. Meanwhile, Scripture tells us that a “furious squall came up”. In case you’re unfamiliar with the Sea of Galilee, it’s a large body of water that seems to draw squalls of wind. In fact, when we visited one tour guide told us that the waves could rise to upwards of ten feet high. Now that would rock your boat, right? 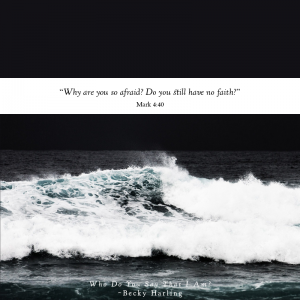 The disciples freaked out and immediately woke Jesus, crying out, “Teacher, don’t you care if we drown?” Ah, doesn’t Satan love to tempt us with that fear? When we’re afraid the first thought Satan often hurls at us is that God doesn’t really care—if He did He would_________________, right? You can almost hear Jesus sigh as He rises from His peaceful nap and rebukes the wind and the waves, “Quiet! Be Still!” (Mark 4:39b). Immediately, the sea grows calm; Jesus gently turns to His friends, asking, “Why are you so afraid? Do you still have no faith?” (Mark 4:40). If Jesus were to ask you those questions, how would you answer? Here’s the thing: fear will come from time to time, and that’s why we need a plan to tame our fears when the storm is raging. Turn Your Panic into Praise. I heard the other day that research has been done that proves that the brain can’t feel anxiety and gratitude at the same time. Wow! That’s big and encouraging news because that means when you feel anxiety or fear, you can quiet your fear by beginning to praise and thank God. As you praise Him, your brain shifts to gratitude, and fear is automatically calmed. The next time fear is crippling you, turn your panic into praise. Turn on some praise music and begin to sing! Or praise God for every good quality of His you can think of—watch how you’ll immediately calm down. Declare God’s Promises Out Loud. For example: when fear cripples you, pray out loud, “Jesus, You promised me You would never leave me or forsake me. Thank You that You are here with me!” Or if you’re fearful over finances, pray out loud, “God, You promised that You would provide for all my needs according to Your riches. Thank You that I can trust You to provide.” When we declare God’s promises out loud, we bolster our faith, and fear begins to vanish. Rehearse Your Emergency Verses. Every home I know has an emergency kit of first aid items. Build a first aid kit for your faith. In a box, put some index cards with verses to encourage your heart for times when you feel afraid. In fact, I suggest memorizing a few of those verses. I remember when I journeyed through breast cancer and memorized Psalm 46 and Psalm 91. Those became emergency verses that I recited whenever I felt afraid. The next time you find your self in a storm, pull out your box of emergency verses and read them out loud! Friend, fearful times will come, and because we’re human we will feel fear. But God doesn’t want us to stay there. We can quiet our fears and strengthen our faith if we turn our panic into praise, declare God’s promises out loud, and rehearse our emergency verses.